Swirlr is an innovative and dynamic new dating service aimed to connect people who want to "Date different." The world is a melting pot and the global community that we live in makes it more possible from ever before to find your love based on character, and not solely color or culture. :a person open to, or practices, the art of multi cultural dating. 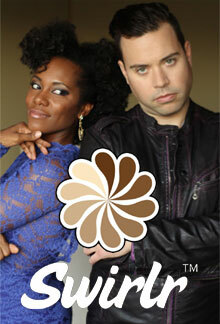 Swirlr is the first interracial dating site to feature a reality show about dating within the realm of multi cultural dating. The online dating site and its associated web series bridge the gap between the online and offline worlds to help singles get out of outdated modes of thinking that have kept people apart for so long. It's a new day, a new time, a new world. Swirlr is here to help to meet people of all ethnicities make a connection and spark some chemistry, no matter the cultural packaging. The Swirlr Web series is hosted by Christelyn Karazin and Jordan Harbinger. Christelyn is co-author of the book "Swirling: How to Date, Mate And Relate - Mixing Race, Culture and Creed", and Editor of the popular blog, BeyondBlackWhite.com. Jordan is a dating and body-language expert and co-founder of The Art of Charm. Both Christelyn Karazin and Jordan Harbinger are currently in successful, long term interracial relationships. Each episode of the unscripted interracial dating web series Swirlr begins with our "Swirling" Experts, Christelyn Karazin and Jordan Harbinger, interviewing single clients who are looking to expand their dating options in the quest for love. Based on personality and potential compatibility, Christelyn and Jordan choose 3 potential matches for a client. Clients then interact with the three initially chosen candidates and select one potential match for a date that will hopefully lead to love. Swirlr is a reflection of our ever-evolving societal and pop culture norms in, both, dating and relationships. The creator of Swirlr, says that he and other producers decided on a web series as opposed to television because "traditional television has been slow to tell America's new stories as they pertain to interracial relationships." "People are diversifying their dating lives like never before in history. They want to see what's happening in real life reflected on the screen. Swirlr isn't your typical ‘vanilla' dating show. Be ready for a heavy dose of chemistry and drama in this breakthrough web series that mixes up how singles date and mate." "There are a lot of firsts here," states Swirlr co-host, Christelyn Karazin. "Swirlr will be the first unscripted dating show that is all about dating different, or ‘swirling' as we like to phrase it. Swirlr.com will also be the first interracial dating site, or dating site, period, to feature a web series about dating within our online dating community."